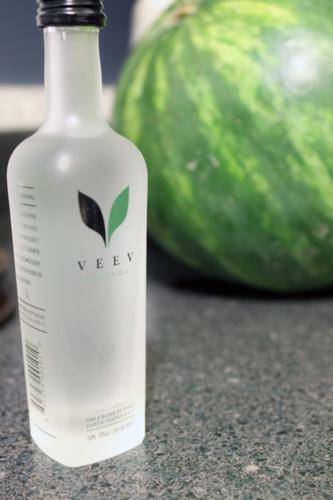 Veev is a liqueur made mainly from the acai berry. The back of the bottle waxes poetic on the heart of the Amazon, the adventurous benefits of acai, and the pleasing addition of other exotic (their word, not mine) fruits. I won’t be quite as mysterious as they are—those other fruits are prickly pear and acerola cherry. And to be fair, all these flavors are exotic to me, in the sense of my never having tried the fruits beyond undoubtedly artificial representations of them in bottled drinks. But first, the legal matters. A Veev sample was provided for me by the Baddish group, along with $20 worth of cocktails featuring Veev and an appetizer thrown in for bonus points at Ruby Tuesday’s off of Capital Boulevard in North Raleigh. So feel free to take any biases you’d like into consideration. I tasted Veev on its own at room temperature, wanting to get a feel for it by itself before trying it out in cocktails. As you can see, it is clear as vodka. The liqueur has legs when swirled around the glass, but not so thick that they take a while to coast down the sides of the glass. It smells like a Black Cherry and Great Bluedini Kool-Aid blend with an alcoholic nibble at your nostrils. The taste is nice—I’m not going to lie, I expected something that reminded me too much of flavored vodka. This spirit, however, tastes much more refined than flavored vodkas and has none of that plastic, artificial sweetener aftertaste I associate with similar spirits. It does have a passing resemblance to Kool-Aid but it’s mellower and only mildly sweet. Veev tastes tropical, but it’s not the banana, pineapple, coconut type of tropical. It’s more berry in flavor, which makes sense, of course, when I consider its ingredients. 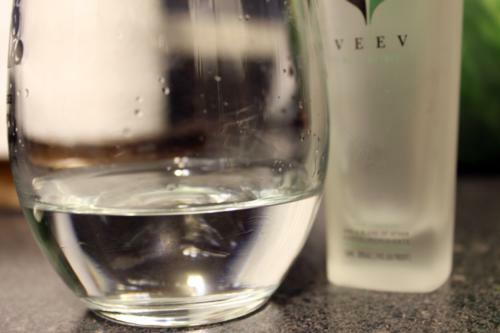 I think Veev is limited for sipping because it doesn’t possess a lot of character—the flavor is soft. That said, I’m finishing this shot with no problem at all, and I think it has great potential for cocktail mixing. For sipping I give it a . Now back to those free cocktails! A friend and I tried out three of the different Veev drinks offered at Ruby Tuesday’s. Worth noting is how amazingly friendly the bartender was. He’ll definitely keep you entertained if you’re pulling up a chair. I learned from him that these drinks have been on Ruby Tuesday’s cocktail list for about five months now. 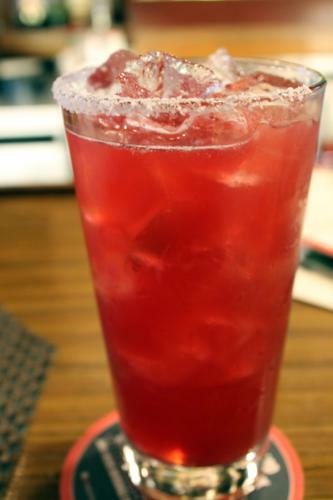 First up was the Pomegranate Margarita ($6) made with POM liqueur, Cuervo tequila, Veev, and agave nectar. It tasted great, like a tropical punch with a strong berry presence. The pomegranate flavor combined well with the berry. However, it wasn’t tart enough for a margarita, and I think a stronger tequila presence would have improved it as well. Drink #2 was the Watermelon Martini ($7). This drink consisted of fresh watermelon, Veev, Grey Goose, and cranberry and watermelon juices. It was a gorgeous drink. My friend and I had vastly differing opinions on its successfulness, though I agreed with her opinion more and more the further along I was with my glass. 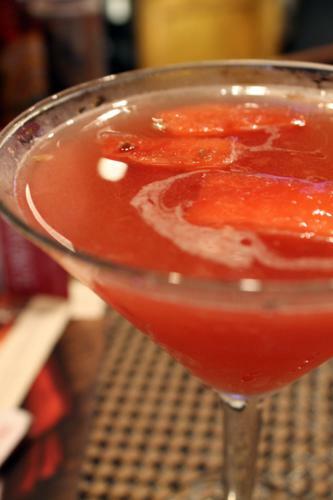 For me, the watermelon taste was prominent right away, especially with the demanding sweetness of the drink. My friend thought the cranberry overwhelmed the other flavors, including the watermelon, entirely. As I kept drinking, I eventually tasted the cranberry, and once I did, it and the sweetness was all I could pick out. It’s definitely a dessert drink in my book, and might be too much for those who don’t have a strong sweet tooth. The final drink is the best cucumber cocktail I’ve had yet. 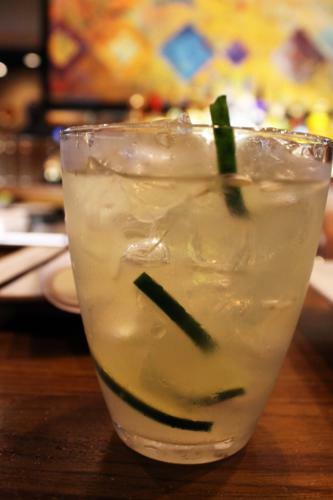 The Superfruit Cooler is made with both Veev and Absolut Berri Acai vodka with elderflower liqueur, agave nectar, and fresh cucumber along for the ride. I’ve had a lot of cucumber cocktails since they burst on the cocktail scene last summer, and this one had the brightest cucumber flavor. I never thought cucumber would pair well with berry (the elderflower is a given), but it did very well. I won’t pretend I could tell the difference between the two acai spirits, but whatever the break down, this drink highlighted the acai’s flavor best of all three cocktails, even enhancing it with the elderflower undercurrent. It’s still a tad too sweet for my taste buds, but that’s a small nitpick. Definitely try this one out. And that’s it for my Veev tasting! Have fun mixing it up in cocktails, and let me know if you come up with anything that surprises you, too. I’d love suggestions on best base liquors to mix it with—something that it can enhance but isn’t as flavorless as vodka would be ideal.